What To Bring To The Gym | Podiatry Associates, P.C. A New Year means a fresh start for many things—including a fresh attempt at exercising regularly and making good use of a gym membership. Lots of people look to gyms to help them take care of holiday weight gain and jumpstart a healthier lifestyle. This isn’t a bad thing. If you can actually commit to exercising and using your gym membership, you’ll see a whole host of healthy effects in your body. It can be intimidating to go to the gym, though. Preparing ahead of time and putting some thought into packing your gym bag so you have everything you need can be really helpful. Workout clothes and shoes – Working out in jeans or other restrictive clothing is an injury waiting to happen. Pack your loose-fitting, moisture-wicking clothes and bring shoes that appropriately cushion and support your lower limbs. Water and snacks – Dehydration is dangerous. Bring a water bottle so you can drink throughout your workout. A snack will help you keep your electrolytes up and avoid a sudden drop in blood sugar, too. Flip-flops or shower shoes – Locker rooms and public showers are high-risk locations for fungal infections, so don’t walk barefoot. Wear these to protect your feet instead. A padlock – Unfortunately, not everyone in this world is honest. A padlock allows you to protect your personal items in a locker while you exercise. The more you prepare for going to a gym and working out ahead of time, the more likely you’ll be willing to follow through on your resolution and work on getting back into shape. 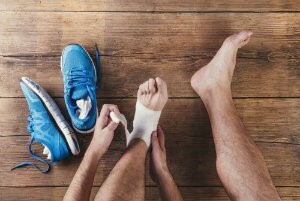 If you’re looking to start a new exercise routine, or you’re struggling with foot pain when you’re active, our team at Podiatry Associates, P.C. can help you take care of your lower limbs. Make an appointment at our Castle Pines, Parker, and Cherry Creek, CO, offices by calling (303) 805-5156.